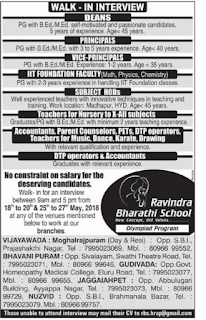 Ravindra Bharathi School, Hyderabad has advertised in EENADU newspaper for recruitment of Dean/Principal/Vice Principal/IIT foundation Teachers jobs vacancies. Interested and eligible job aspirants are requested to interview on 18th to 20th and 25/05/2018 to 27/05/2018.Check out further more details below. 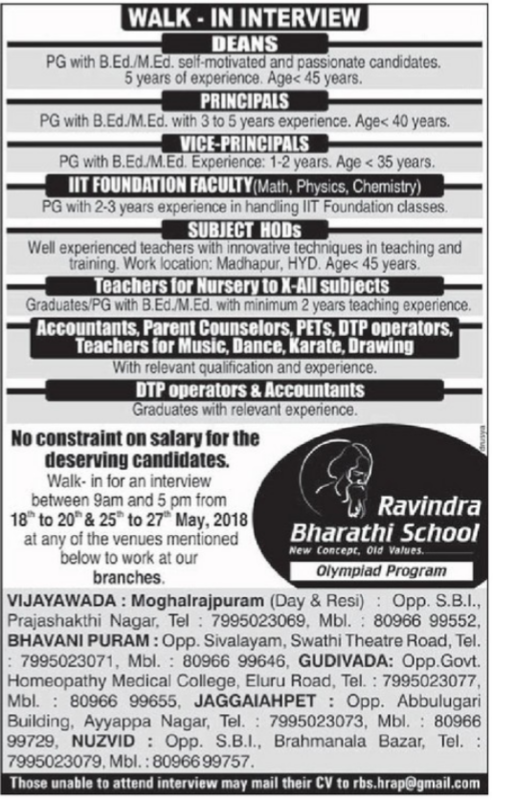 Name of the School: Ravindra Bharathi School, Vijayawada. About School: Ravindra Bharathi School established over Twenty three years ago at Nellore was well received by parents and students of that region. This in turn motivated the management to spread the good deed to other parts of the state too. Spread all over Andhra Pradesh, in response to the encouragement of the parents, the responsibility to maintain uniform standards and facilities is challenging. But the desire to serve the society is strong and acts as the driving force and the guiding spirit to keep the good work going. Dean:PG with B.Ed/M.Ed,5years of Experience,Age<45 years. Principal:PG with B.Ed/M.Ed,3-5years of Experience,Age<40 years. Vice-Principal:PG with B.Ed/M.Ed,1-2years of Experience,Age<35 years. IIT Foundation Teachers:PG with 2-3 years of experience. Teachers:PG with B.ED/M.ED with minimum 2 years. No constraint for the deserving candidates. How to Apply: Interested candidates may appear for the walk-in interview on 18th to 20th and 25th to 27th May 2018,at 9 a.m to 5 p.m with all testimonials with a recent passport size photo and updated resume. Those unable to attend interview may mail their CV to rbs.hrap@gmail.com. Reference: Advertisement on EENADU newspaper Dated 18th May 2018.